Lame Adventure 313: What Do I Know? I love live theater preferably on a stage, not two hotheads having a yelling match at each other on a subway train. One way I can afford to see as many off-Broadway plays as I do is I volunteer usher, something I do once or twice a month. This allows me to see theater for free. The only downside to volunteer ushering is sometimes a show is a dud, but more often, they’re good. 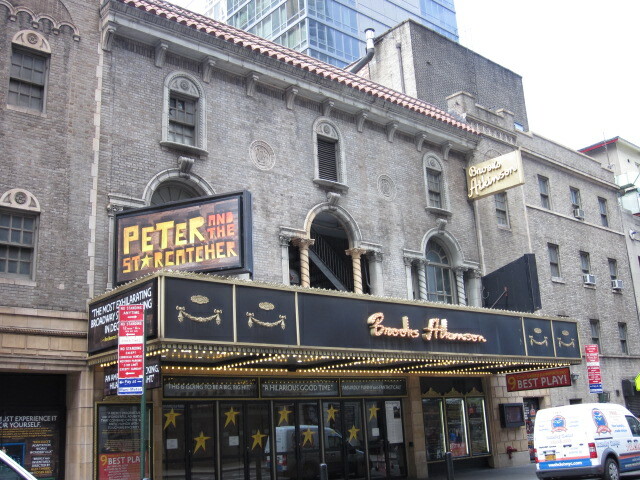 “Peter and the Starcatcher”, a play I volunteer ushered off-Broadway that has transferred to Broadway and is now nominated for 9 Tony awards. This was not a dud. Many volunteer ushers are retirees, students or aspiring actors. Most are pleasant, but when I worked my most recent ushering gig I encountered Sour Usher. Sour Usher is a retired woman 10-15 years my senior that’s built like Sitting Bull. I have encountered her several times over the course of the 3 ½ years I’ve been volunteer ushering, but she has never given me a single nod of recognition. When I say, “Hi,” she gives me the “Who are you?” look. Together, we recently ushered a play that’s still in previews. It officially opens later this week, so there might still be some tweaks made to it between now and then. She’s a complainer-type who has been volunteer ushering forever. Therefore, she thinks she’s an authority that knows more than everyone in the theater company combined. When I last ushered with her, it was for a delightful musical at New York Theater Workshop called Once. At intermission, she confided that she hated the show. I told her that it was an adaptation of a film. She was unfamiliar with the film and told me that she had no interest in seeing it. Sour Usher: Is this like the movie? Me: Yes, it’s following the story closely. Sour Usher: So the movie was lousy, too. Once transferred to Broadway earlier this year and has since been nominated for eleven Tony awards. 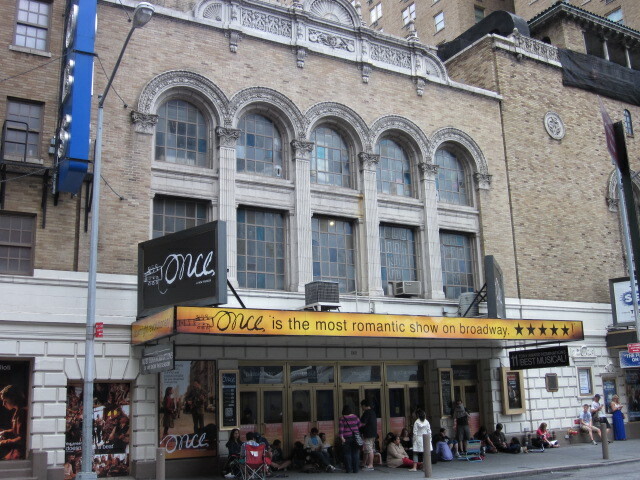 People parked outside the Jacobs theater at 9 am hoping for tickets to the 3 pm matinee of “Once”. The play Sour Usher and I ushered recently was one neither of us were familiar with. The program had a preface that indicated that it has been in development since 2004. Sour Usher zeroed in on the fact that its earliest origins were as a short film for a Food Network competition. Sour Usher: Can you believe this? They’re staging a cooking show! I know I’m not going to like this. Me (defiantly): This is one of the most respected off-Broadway theater companies in the country. We’re seeing this play for free. Give it a chance. It’s not like we’re witnessing an execution. Me (weaselly): Well, that sounds different. Sour Usher: There’s nothing in this play for me. It’s all cliché, predictable, pointless. It’s too many stories happening at once and not a single one interests me. When it opens, the Times will kill it. Me: Like the way they killed Once? Me: You really think that? She looked at me and sniffed. Maybe I did involuntarily cut a silent-but-deadly. Sour Usher: You like this? [disgusted] You did applaud. Me (defiant): I applauded because I’m entertained, I think it’s a novel play that’s well staged and I’m interested in what happens next. Is that criminal? Me (weaselly): I applaud out of habit. Sour Usher (mouth full): No. 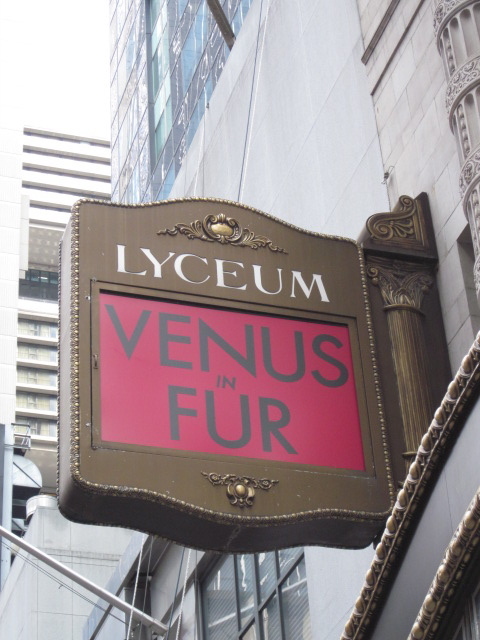 “Venus in Fur” debuted off-Broadway at Classic Stage Company in 2010 before transferring to Broadway last fall. It’s received Tony award nominations for Best Play and Best Actress (Nina Arianda). This entry was posted in Humor, new york city, theater and tagged Broadway, jerks, off-broadway, ushering. Bookmark the permalink. Well, at least Sour Usher gave you a good blog post. She’s an interesting character, and you’ve captured her well. Plus, it’s fun learning more about your ushering. What a brilliant way to see plays! Sour Usher may think you’re an idiot, but does she know you ARE a lame-adventurer? You think a four-eyed, yellow-bellied, spineless coward like me that cannot fathom the courage to anemically utter, “This play may not be the second coming of Death of a Salesman, but I still think it’s got infinitely more merit than any episode of Punky Brewster,” would dare reveal to Sour Usher that I’m the mastermind behind Lame Adventures — and I’m inspired to share her rancid personality on line? The next time I see her I’ll probably hide under a seat … Or not. Glad you enjoyed this one Kathy! Wow, what a pill. What’s with people like that? You could tell them they’ve won a million dollars and all they would do is complain about how much tax they’re taking out of that million. What exactly is she even there for, then, if she hates the theater as much as she clearly does? I haven’t seen Once but every person I know who has seen it says it’s fantastic. Sour Usher needs to get laid, and fast. My sentiments exactly, Madame W! Do you know Sour Usher? Was she your dreaded 8th grade math teacher? Once is a lovely musical, but if you can’t make it to the theater, the film is rather charming, too. ….skips away whistling some silly tune…..
I’m not exactly a walking ray of sunshine myself, but I’m not an ingrate whenever I score free entertainment. Even if I thought I was watching Hell on Earth (and I have seen some stink bombs explode n the boards) I resist blathering about how much I hated that show until later — when I purge myself about it to my friends. Sour Usher. Huh. Talk about a turd in the punchbowl. You’ve got that right Jules! New York’s martinet mayor, Michael Bloomberg, has yet to force Gotham City residents to volunteer usher but please, Tom, DO NOT give him any ideas! I did not get the impression that Sour Usher is a scribbler herself, just an accomplished whiner with a yen for gingerbread. You’re right there Guat! The sour DMV person that operates the license photo camera is surely a direct descendant of the Marquis de Sade. I did not win any point with her when I pointed out, “If 50’s the new 40 and 40’s the new 30, can I shave off 20 years on my license?” If she could she would have taken my picture with an AK 47. Hey, thanks for commenting! Sour Usher is the reason why Broadway shows fail. Her negativity infuses the atmosphere and makes enjoyment impossible. She needs some sweetening up. Or murdering. After intermission Sour Usher noticed that some audience members did not return. Since she was unhappy with our seats she wanted to take two on the aisle in the row behind us, but I saw the ticket holders, a mother with her daughter (the kid was around 11), returning. I said, “We can’t do that. Those seats are taken.” Sour Usher told them to take two other seats. I wanted to die on the spot. The mother was cool about it. If Sour Usher loves to stuff her face so much, you’d think she would have *loved* a show about food. At least when she was chewing, she probably wasn’t talking. Unless she’s one of those. Actually, Jess, she’s one of those. omg I HATE Negative Nancies!!! Such a drag on what could inevitably always be very enjoyable experiences. Thanks for another enjoyable – although eye-roll-inducing – post! And also ps – brava to you on getting into off-broadway ushering! I’ve managed to sign up to an email list for a little theater by my house but haven’t had much luck finding other ways to get involved with other theaters. They’re the first theater company I started volunteer ushering for and they’re great. If you don’t live in NYC, just call or email your local theaters and ask if they use volunteer ushers. Good luck! Sour usher is my mom. Who is angry at you for no longer lunching with Mr. Van Munching. You’ll be delighted to know that I’m now engaged to Monseuir Van Munching. I can’t wait to become Madame Van Munching and continue lunching. So you’re trading in your cool New York chick flavor for crustless cucumber sandwiches and Earl Grey tea? Western Civilization will never be the same! And to think that Sour Usher is in the form of others at volunteer events … plus are also sour co-workers, sour neighbors, sour _____. Maybe she’s the human equivalent of the sour grape? Which happens to make lousy wine. You’re so right my fellow connoisseur (of the affordable bottle; I will now think of you whenever I come across another one with an animal in the name)! Oh … given all the animals on the post … at our recent church wine group gathering, what is the odd of not one … but THREE of the same name. Thou attendees didn’t look hard enough! If you share your post with your fellow churchgoers they might think that your quaffing readers could fill Noah’s Ark with animal-named vino. You did inspire us. Last December I quaffed a tempranillo with a bull on the label. I think it was Dancing Bull. I liked it. I urge you to try it. Plus, you’re a guy with a fine appreciation of cartoons. This has the elements to be one of your favorite wines! I’m also one who isn’t afraid to try something off the shelf on a whim! Same here — I always welcome stumbling upon gems, although I have quaffed a few beverages that should have stayed on the shelf, possibly very high up and in the back. Don’t get me started about blueberry flavored ale. That’s very wise of you. The one good thing about it is that it does not stain your tongue blue although the taste lingers. It may make a lousy wine, but Man-O, Man-O, shewitz, what a WHINE. Maybe instead of being a Sour Usher, she’d be better off to just CURdLe up with a good book in the privacy of her own little world. Do you think there is such a thing as a good book to Sour Usher? Well if there was ever a softball, dear Madam LA, what else would she read? Might I suggest a wee bit of Poe…The Fall of the House of Usher? That’s an upper deck home run of a comment Mike! Sour usher sounds like a lot of fun. Perhaps you should invite her for dinner, or name a child after her or something – even though she would probably hate both. Yes, Terri, she was/is quite a grump. I don’t think I’ll be inviting her over to break bread in my sanctum sanctorum in this lifetime. Thanks for visiting Lame Adventures-land! No, I have not considered that possibility but odds are good that if S.U. somehow found this site since she loathes humor and thinks I’m an idiot I doubt she’d linger. Therefore, I don’t think she’ll be offing me in a drive-by shooting anytime soon. I like blueberry pie and muffins. But on the liquid refreshment front I, too, have been disappointed. Johann’s claims to the contrary, Gevalia dropped the ball with their blueberry flavored coffee. Blueberry pie and muffins rock. Blueberry flavored coffee sounds repulsive. What? No response to what (admittedly not iced tea spewing funny) I thought was one of my more thoughtful posts. I trust it merely fell through the cracks amid the flurry of witty bon mots. I was hoping not to have to resort to referencing vaginaplasty so soon. But I guess I just did. Damn. BTW just turned T-13 today. Celebrated with my own LA taking our Cavalier (dog not Chevy) to the groomer at 88. Riding on the 8:35 from Glen Ridge. What I like to call The Slacker Special. That was T-17. Bad Math Day. Full confession it’s been a busy week at The Grind (i.e. minimal time to screw off), I’ve been out every single night so I’ve been away from my computer plus I have a dumb phone so I can’t rely on that common modern device to access my site. You’re getting the family hound all spruced up, is that how you celebrate your natal day? No other plans? Happy birthday Mike! A “cyber condom”? Plausible deniability sounds like a government agency or a music group or maybe I could use it as the title of my autobiography? As a faithful employee of the USG for over 25 years I can say that the phrase Plausible Deniability is not so much an agency or department as it is an ethos. As we used to say at my former place of employ: Admit Nothing, Deny Everything, and Make Counteraccusations. Almost as famous was my unit’s seal which depicted 2 vultures with caption that read: To hell with waiting for something to die. Let’s go out and kill something. Hey, you’re getting super patriot on us! Due to aforementioned aging I cannot be sure but didn’t Aerosmith discuss this subject in Walk This Way? Just checked http://www.Lyrics007.com. Yep, that’s what I thought. I was someone else in my younger days. I’ve mellowed considerably. Most of us were someone else in our younger days. Often thinner.